Colorful arcade game, belonging to the casual genre of endless runners. We play the role of graphic artists caught in the hot deed, who are forced to flee from a police inspector and his dog. Subway Surfers is a colorful representative of the popular on mobile devices endless runners. The game is a result of cooperation between SYBO Games studio and Kiloo team experienced in mobile games, which has had several versions of the popular Hugo series in versions for smartphones with Java. In the game we play the role of juvenile graphic artists, who, caught while making paintings on railway cars, are forced to flee from the police inspector chasing them and his dog. The game boils down to efficient movement on the roofs of wagons and railway tracks and avoidance of emerging obstacles, including oncoming trains. Our controlled character can move on one of the three available tracks, jump over and roll under obstacles, as well as use a special jet skateboard. During the escape, we also collect money, which can then be exchanged for better skateboards, jetpack, and even bonus hero characters. 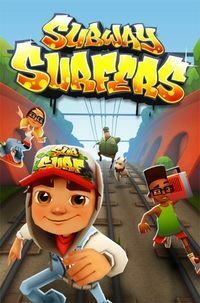 For a typical casual production, Subway Surfers is characterized by a pretty good soundtrack and simple, but extremely colorful graphics in HD resolution. It is worth noting that along with subsequent updates, the creators introduced the World Tour mode, in which we are provided with completely new scenes (e.g. Arabia) and characters of the characters.